The Civil Aviation Department of the Nagorno-*ara*akh Republic has announced that flights from Yerevan to Stepanakerts newly renovated airport will begin May 9  a date that also marks the re-taking of Shushi (1994) by Armenian forces. A one-way ticket for the 35-minute flight is expected to cost 15,000 drams ($41) and will be operated by Artsakhavia Airlines on three 50-passenger SRJ-200 aircraft. Meanwhile, the Civil Aviation Administration of Azerbaijan says it has a right to shoot down any aircraft flying into the airport as it would violate the no flight zone designated by the Azeris, who see the self-declared NKR as occupied territory. "Azerbaijan Threatens To Shoot Down *ara*akh Planes"
Yeah!! Sure!! Helicopters have been flying between Yerevan and Stepanakert a hundred times a day for at least 20 years. 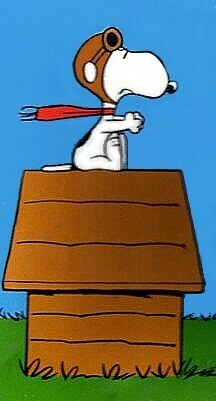 and this is their ace pilot, ali-snoopy the red baron. Edited by Arpa, 16 March 2011 - 06:27 PM. The hell with them. Let them dare to make a move. I'm gonna fly to Artsakh on May 9 to celebrate the Shushi liberation day. department at the office of the Artsakh President. self-possession, but openly support Nazi values." statements of the kind," he stressed. be fraught with unpredictable repercussions for Azerbaijan itself,"
even possible to physically destroy airplanes which are heading there,"
opposing side in order to prevent incidents," he said. Artsakh government, Dmitry Atbashyan told a PanARMENIAN.Net reporter. trained to take up duties by the opening date," he said. They should be locked up in the same cell and rant all they want. Why is that one is labeled a terrorist and the other as a "saint". Thye both buy their wmd's with petroleum money. Anticipating the move, Gaddafi had threatened to attack any air or maritime traffic in the Mediterranean, including civilian targets. He took to the airwaves to condemn any UN action as an act of ‘flagrant colonisation’. ‘This is craziness, madness, arrogance,’ ranted the dictator. Edited by Arpa, 18 March 2011 - 12:36 PM. STEPANAKERT. – Armenian President Serzh Sargsyan arrived in Stepanakert within the framework of celebrations dedicated to the Victory Holiday, the Day of the Artsakh Republic Defense Army and the liberation of Shushi. President of Nagorno-Karabakh Republic Bako Sahakyan and other officials met the Armenian President at the airport. The Presidents visited the airport complex and got familiar with works carried out there, NKR presidential press service informed Armenian News-NEWS.am. **When will we ever stop speaking furkish!!?? tension and controversy - will open "next week". been delayed "for technical reasons". of land viewed by Azeris as still belonging to them. the government to decide," Mammadov said. Ramil Safarov, who had brutally killed an Armenian officer in Budapest. years he had been in jail in Hungary, and gave him an apartment. apart in any meaningful way for reconciliation to be expected. Nagorno Karabakh Republic David Babayan. Head of the Central Information Department. Government of the Republic of Armenia Nelly Cherchinyan. of the modern large aircrafts has become possible. condemned as well by the international community. open an airport in Khankendi. quoted Abdullayev as saying on its website. peace to be restored," he added. passenger to fly from Khankendi, according to media reports. of Azerbaijani Defense Minister Eldar Sabiroglu. Azerbaijan itself. No aggression against Artsakh will go unpunished,"
Azerbaijan compels Turkey to pressure Armenia? 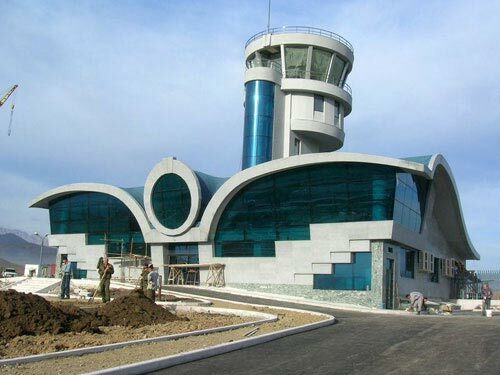 The opening of Nagorno-Karabakh Republic capital city’s Stepanakert Airport is still causing concern for Azerbaijan. “If Armenians conduct flights to Nagorno-Karabakh, Turkey may close its air space to Armenia,” a secret diplomatic source told APA News Agency of Azerbaijan. The source also noted that official Baku and Ankara have some arrangement regarding this matter, which was frequently discussed recently by the aviation departments of Azerbaijan and Turkey. The Armenian General Department of Civil Aviation did not comment on this information. Also, Turkish MP and Nationalist Movement Party (MHP) member Sinan Ogan told very same APA News Agency that Turkey could close its air space to Armenia, but at the same time he raised a question: In that case, through which route will the flights to Nakhichevan be conducted? As Armenian News-NEWS.am informed earlier, the Stepanakert Airport is already launched and the flights are expected to start soon. And in response to this development, Azerbaijan threatened to down Armenian airplanes. According to the Azerbaijani press reports, that country’s foreign ministry says it will strengthen efforts to stop what it calls “illegal visits to the occupied territories”. This past Saturday, Azerbaijani Ministry of Foreign Affairs Elman Abdullayev told journalists that instructions to this effect had been relayed to Azerbaijani diplomatic missions overseas. The Azerbaijani Trend news site reports that Turkish FM Ahmet Davutoglu publicly opposed the opening of the airport in Stepanaket, Artsakh’s capital, at today’s meeting in Baku of the Council of Foreign Ministers of the Economic Cooperation Organization. "The intention to open the airport in Khankendi is a negative step. Primary goal should be a peaceful settlement of the Nagorno Karabakh conflict," Davutoglu said. He noted that Turkey has condemned this action and stated that such a step is unacceptable. "This move could harm the peace process over the Nagorno-Karabakh conflict. We are close to Azerbaijan in this issue, and we will support it," the minister noted.